Cameron Bancroft has denied rumors of a rift between him and David Warner. 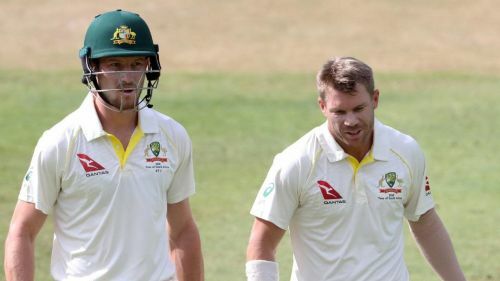 Australian cricketer Cameron Bancroft has ruled out the talks of a rift with teammate David Warner after he was accused of putting blame on Warner in an interview regarding the controversial ball-tempering incident. “I know that all three of us have really stuck by each other and looked after each other well. You can’t understand the trauma I felt, it was probably very different trauma to how he (Warner) felt, and I can’t possibly understand that.”Bancroft told state radio station ABC. The year 2018 wasn't a memorable one for the Australian cricket team. At the beginning of the year, the team was hit by a major setback as three of its players were caught in a ball-tampering hoax during a Cape Town Test against South Africa. Cricket Australia banned all the three cricketers involved in the incident, including skipper Steve Smith, David Warner, and Cameron Bancroft. During the Boxing day Test between Australia and India, Cameron Bancroft said in an interview that he was an impressionable rookie just wanting to “fit in” to the team, which led to him being criticized by the cricketing fraternity. However, two months after the incident, the right-handed batsman opened up about it. “I guess moving forward there will be great lessons for all of us, including Dave. That’s something we’ve all shared with each other and something I’ve certainly shared with Dave when we’ve communicated throughout this entire journey.” He added. After a nine-month ban, Bancroft made an impressive first-class return, scoring unbeaten 73 runs for Western Australia at stumps on the first day. He will be now eying to make comeback in the national set-up.